So when we traditionally think of A/B testing, we usually think of testing a variable while leaving the time period and audience the same. We test the homepage headline during a two week period in August, where half our website visitors see THIS HEADLINE and the others see THAT HEADLINE and we see who clicks through multiple pages or sticks around on the website longer or is more likely to make a purchase. (You have to pick what you care about, since caring about everything is not only exhausting but not possible in a testing sense). 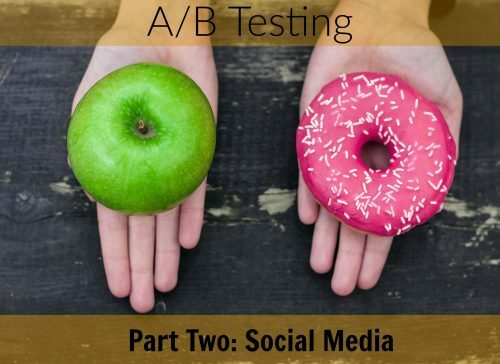 If you want more about the basics of A/B Testing and how A/B Testing could work with your website, check out those linked blog posts. We can’t show half our Facebook audience Image 1 and half Image 2… so we have to think of social media testing a little differently. One thing you’ll notice, in particular with Facebook and other social media sites that work on algorithms, is that most people never see your posts… which means you can repeat stuff with a) little to no chance of the same people seeing your message and b) even if a couple people did see a repeat message, it might not register considering the volume of other messaging they see from everyone else. Posting the same thing at different times may feel spammy but it can give you a good idea of when a given post is most likely to be seen. It’s not true ‘A/B’ testing but similar in that we’re testing only one variable (in this case, timing versus content) and using data to give us feedback. What these kind of ads allows us to do is display different content at the same time to the same users… and see what converts them. This is a more accurate application of A/B testing since we are showing the same users at the same time multiple content choices and seeing what they react to. Now you’ll notice with the example above, both the image and text vary in each picture. In the best test, we’d only have one variable be different (the text or the image). Being able to see, for instance, that the Premium Italian Leather image getting more clicks, the company could further test by using the same headline with different images, seeing if indeed it was the photo or text that caused more interest in the messaging. Like this month’s A/B testing theme? Stay tuned for next week when we talk about A/B testing with email newsletters! Subscribe here.